Professor of Medical Physics, P. S. Govindasamy Hospitals, Coimbatore - 641 004, Tamil Nadu, India. Source of Support: Atomic Energy Regulatory Board (AERB), PSG College of Technology., Conflict of Interest: There are no conflicts of interest. In the present work, a pediatric head and body phantom was fabricated using polymethyl methacrylate (PMMA) at a low cost when compared to commercially available phantoms for the purpose of computed tomography (CT) dosimetry. The dimensions of head and body phantoms were 10 cm diameter, 15 cm length and 16 cm diameter, 15 cm length, respectively. The dose from a 128-slice CT machine received by the head and body phantom at the center and periphery were measured using a 100 mm pencil ion chamber and 150 mm CT dose profiler (CTDP). Using these values, the weighted computed tomography dose index (CTDIw) and in turn the volumetric CTDI (CTDIv) were calculated for various combinations of tube voltage and current-time product. 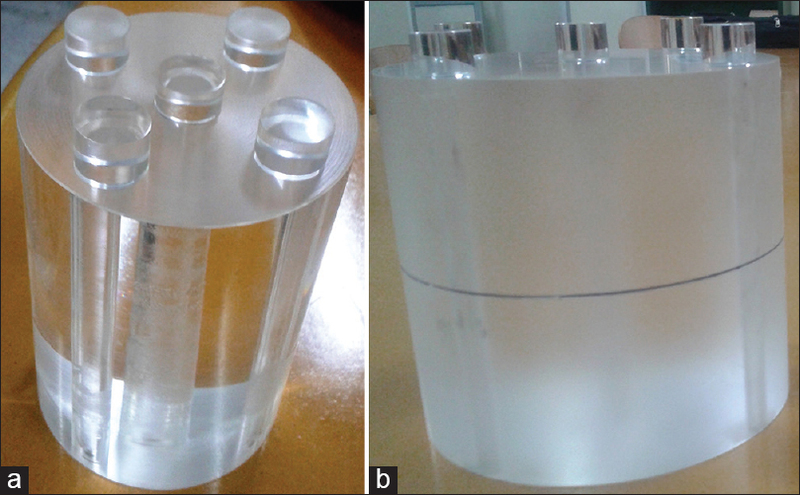 A similar study was carried out using standard calibrated phantom and the results have been compared with the fabricated ones to ascertain that the performance of the latter is equivalent to that of the former. Finally, CTDIv measured using fabricated and standard phantoms were compared with respective values displayed on the console. The difference between the values was well within the limits specified by Atomic Energy Regulatory Board (AERB), India. These results indicate that the cost-effective pediatric phantom can be employed for CT dosimetry. The utilization of computed tomography (CT) in diagnosing pediatric patients has increased considerably due to increase in the number of medical applications pertaining to pediatric CT.,,,,,,, Despite the obvious benefit that pediatric patients and their families derive from the diagnostic information that CT provides, the radiation dose used in CT for pediatric patients has recently come under scrutiny, and the radiobiological consequences ,, appear to be nontrivial. It is well-known that CT delivers radiation dose that is typically at the high end of the diagnostic dose range, and although CT examinations represent only a few percent of the total number of X-ray examinations, they are already the largest contributor to the collective effective dose from medical exposures. Though the recent technical developments in CT, that is, the advent of multislice CT (MSCT) which has extended the range of its applications in diagnosing a pediatric patient, risk factors leading to radiobiological effects is also involved if nonoptimized technical scan parameters are used. In pediatric patients, all the organs are located closer to the scan field and are susceptible to radiation when compared with adults. Hence, irrespective of the age, based on the size of pediatric patients the scan parameter needs to be optimized to minimize the radiation risk which can be realized by quality assurance (QA) of machines and selection of optimized scan parameters by technicians. In this regard, the dose distribution in pediatric patients for the selected scan parameters can be studied and optimized using pediatric CT dose index (CTDI) phantom. Number of factors prevents the hospitals from performing the QA and optimization studies. One such factor is the cost of pediatric CTDI phantom. As the commercially available pediatric CTDI phantom is expensive, most of the hospitals in the developing countries do not show interest in such studies. Considering this issue, the aim of the current study is to fabricate a low cost pediatric CTDI head and body phantom and use it to evaluate CTDI to optimize scan parameters and eventually carry forward the study for setting national dose reference levels (DRLs). The study was carried out using Siemens 128-slice Somatom Definition Edge CT scanner installed in PSG Hospitals, Coimbatore, India. The routine scan parameters for average pediatric patients used in this particular hospital was selected for CT procedures (head, chest, and abdomen) are summarized in the [Table 1], and the scan parameters selected for CT dosimetry studies are given in [Table 2]. Usually CTDI is measured by integrating the dose from a single CT using a 100 mm long pencil ionization chamber and can also be obtained by making many point dose measurements along the z-axis to determine the dose profile D(z) and then obtain the integrated dose. In this study, in-site CT dose measurements were carried out using a standard calibrated 100 mm pencil ionization chamber (DCT10 RS, S/N 1636) with Solidose electrometer 400 (S/N 4253) and CT dose profiler (RTI Electronics make) [Figure 1]. The CT dose profiler (CTDP) has one solid-state detector (marked SENSOR in [Figure 1]) placed 3 cm from the end of the probe. The CTDP probe has a greater length of 15 cm to suite 15 cm length of CTDI phantoms. The detector in the profiler is very thin (250 µm) in comparison to the beam width, and is therefore well-suited for point-by-point scanning of the beam. The detector is used to collect the dose profile and it can also be used as a trigger. As radiation hits the detector in either direction, the detector registers the dose value at that point and sends the information to the software. The electrometer can collect 2,000 such dose values per se cond. When the radiation goes below the trigger level, the software is designed to present all the collected data points in the form of a graph. CTDP is used as a general dose detector which can handle very small field sizes. Since the detector is rotational symmetric, the CTDP can measure dose when the tube is rotating. The advantage of the CTDP over pencil chamber is that it can give integrated dose beyond 10 cm length of the CTDI phantom as well as for maximum beam width of the scanners. Also CTDP can provide the actual dose profile curve after exposure, but the ion chamber cannot. The CTDP replaces the conventional thermoluminescent dosimeter (TLD) and optically stimulated luminescence (OSL) methods or film for dose profile measurements. CTDP is connected to Piranha 557 [Figure 2] via wire and Piranha is connected to CTDP analyzer software via Bluetooth. The measurement is conducted during a helical (spiral) scan so the table must move during the measurement to allow the probe to scan the entire beam width. Traditionally, CTDI measurements with an ion chamber must be made with axial scans. The CT dose indices were measured based on the five-point method proposed by European guidelines  by using pencil ion chamber and CTDP for standard and fabricated phantoms. electrometer system and displayed on the dosimeter unit. CTDI is actually defined for a single complete rotation of CT scanner. In the equation above, n is the number of data channels in the multislice CT, T is the slice thickness corresponding to one channel and the integration is carried out over the length of the pencil chamber (100 mm); in our particular case nT = 5 mm (the slice thickness selected). 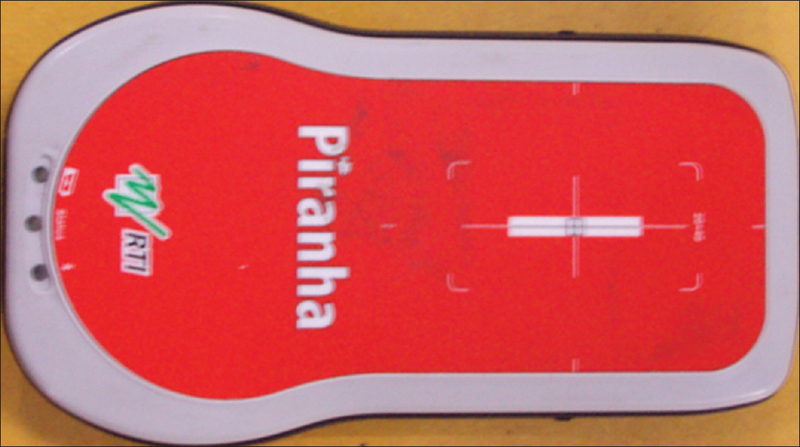 As far as the CTDP is concerned, the doses received by the standard and fabricated phantom at the center (CTDI100, c) and periphery (CTDI100, p) were measured using CTDP connected to a Piranha 557 dosimeter for the machine operating parameters. The dedicated CTDP software viz., CT Dose Profile Analyzer displays both the graph pertaining to dose/s along the z-axis and the corresponding CTDI100, c and CTDI100, p. Using these values, weighted CTDI (CTDIw) and volumetric CTDI (CTDIv) were calculated. The CTDI100, c and CTDI100, p measurements were repeated five times using developed phantoms with both detectors and the mean values with standard deviation (SD) are reported in tables. CT pediatric head and body phantom was fabricated using polymethyl methacrylate (PMMA) of density 1.19 g/cm 3. Two PMMA cylinders of 15 cm length and 10 and 16 cm diameter each were purchased. The cylinder of diameter 10 cm was used to make the head phantom and the one with diameter 16 cm was used to construct body phantom [Figure 3]. In both the phantoms, five holes were machined in our workshop, one exactly at the center and four in the periphery. The peripheral holes were spaced 1 cm from edge and 90° apart from each other. The inner diameter of all the holes was 1.31 cm. All the dimensions have been chosen in compliance with Food and Drug Administration (FDA) norms. Ten PMMA rods of diameter 1.31 cm and 15 cm length were also machined. The holes other than the one that contained CTDP were plugged using these rods when the study was carried out. The cost per fabricated phantom was just 10% of the standard one. Figure 3: Pediatric CTDI: (a) Head phantom and (b) body phantom. The main objective of the work was to ensure that the characteristics of the fabricated phantom were equivalent to that of the standard imported one. In this line, initially the doses received at the center and periphery of the fabricated and standard phantom was measured using the dosimeters mentioned above. The center and peripheral dose received by the ion chamber were converted into CTDIc and CTDIP values and displayed in the Solidose electrometer; whereas a graphical output along with CTDI100 values was obtained while using CTDP. The graphical output is given in [Figure 4] and [Figure 5]. 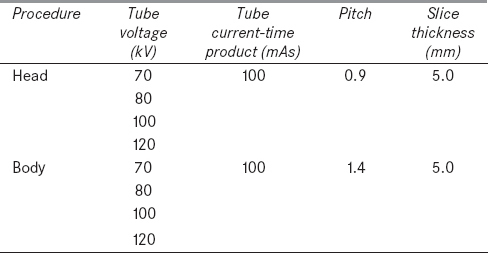 [Figure 4] and [Figure 5] show that the actual dose profile generated at the center and periphery point 'A' after exposure to the X-rays produced for a potential of 100 kV, having a current time product of 100 mAs and slice thickness of 5 mm. The observed dose profile depends on a number of factors such as alignment of the beam, unsymmetrical collimators, heel effect of the tube, the design of the table that supports the CT phantom, etc. In the helical scan mode, the rotational X-rays hit the CTDP located at either the center or peripheral hole of the phantom. The X-rays during their travel through the phantom are attenuated due to scattering process, and as they reach the sensor in the CTDP, it starts collecting the data as seen in the above profiles. This graph has not been filtered, and therefore shows a number of reoccurring dips. A dip occurs each time the tube goes beneath the table and the distance between two dips is the distance the table moves during one rotation. The dips are more pronounced in the profile corresponding to peripheral dose when compared to the center due to continuous change in the distance between X-ray tube and the sensor. While operating the CT in helical scan mode, the X-ray tube does not rotate with an exact number of turns. The CT Dose Profile Analyser software integrates the measured dose rate values between the dotted lines separated by 100 mm to give the respective CTDI100 which can be used for further calculations. Thus, using the CTDIc and CTDIP values, weighted and volumetric CTDIs were calculated and the mean values along with SD is given in [Table 3] and [Table 4]. From [Table 3] and [Table 4], it was observed that while measuring the dose at the axial and periphery using both CTDP and ion chamber, for a combination of tube current-time product and voltage, the center of the head and body phantom received less dose when compared to periphery, which is attributed to a constant focus-axial detector and a varying focus-peripheral detector distance during rotations. Also, scatter is constant from other portions of the phantom at the center, while it varies at the periphery. The second observation is that the dose received by the head phantom is more when compared to the body phantom. This is because; the attenuation is less in the head phantom due to a smaller dimension when compared to body phantom. Further, an increase in tube voltage leads to an increase in the relative dose level at the respective positions. This is due to increase in X-ray intensity with respect to increase in tube parameters. Comparing the CTDI values obtained using different types of detectors viz., CTDP and ion chamber, it was found that the values were more while using latter when compared to the former. Solid state detector values were lesser than the ion chamber values by 10% and this decrease may be attributed to energy response of the solid state detector. Subsequently to assess the performance of the fabricated phantom, a comparison between CTDIv obtained using the fabricated and standard phantom and also with the ones displayed in the console has been carried out. The measured CTDIv with respect to the console values and the percentage difference between measured and the console values are presented in [Table 5] and [Table 6]. The values in [Table 5] and [Table 6] are also represented graphically in [Figure 6](a) and [Figure 6](b). It is apparent from [Table 5] and [Table 6] that the difference between the measured CTDIv corresponding to fabricated and standard phantom is very small. This is an indication that the quality of the fabricated phantom is on par with the standard one. Also, from [Table 5] and [Table 6] it is found that the percentage difference between the fabricated and console CTDIv and standard and console CTDIv are well within the limits recommended by Atomic Energy Regulatory Board (AERB) which is based on International Commission on Radiological Protection (ICRP) standards.,, The large differences for lower kVs may be due to the dose evaluation/calibration method employed by the manufacturer. Hence, this study confirms that the quality of the pediatric phantom that was fabricated at a lower cost for the purpose of CT dosimetry is on par with the standard one. Relatively inexpensive pediatric CTDI head and body phantom suiting average Indian infants was developed for measuring CT dose indices to reduce radiation risk to the infants. The radiation output from the Siemens 128-slice Somatom Definition Edge CT scanner was evaluated using the standard pediatric phantom before ascertaining the performance of the developed phantom. After ensuring the proper performance of the CT scanner, the dose received by the developed phantom was measured at the center and periphery using the calibrated pencil ion chamber and CTDP. Using these values, CTDIw and CTDIv were then calculated and compared with the console values. The difference between the values was well within the limits specified by AERB, India. These results indicate that the cost effective pediatric phantom can be employed for CT dosimetry applications. Atomic Energy Regulatory Board (AERB), PSG College of Technology. Zacharias C, Alessio AM, Otto RK, Iyer RS, Philips GS, Swanson JO, et al. Pediatric CT: Strategies to lower radiation dose. AJR Am J Roentgenol 2013;200:950-6. Strauss KJ, Goske MJ, Kaste SC, Bulas D, Frush DP, Butler P, et al. Image gently: Ten steps you can take to optimize image quality and lower CT dose for pediatric patients. AJR Am J Roentgenol 2010;194:868-73. Mettler FA Jr, Wiest PW, Locken JA, Kelsey CA. CT scanning: Patterns of use and dose. J Radiol Prot 2000;20:353-9. Wiklund LM, Brolin I, Sjoholm K. Nonionic contrast media in pediatric CT: A comparative study of intravenous use of iopentol and iohexol. Acta Radiol 1994;35:186-90. Thomas KE, Owens CM, Britto J, Nadel S, Habibi P, Nicholson R. Efficacy of chest CT in a pediatric ICU: A prospective study. Chest 2000;117:1697-705. Ruess L, Bulas DI, Kushner DC, Silverman PM, Fearon TC. Peak enhancement of the liver in children using power injection and helical CT. AJR Am J Roentgenol 1998;170:677-81. Plumley DA, Grosfeld JL, Kopecky KK, Buckwalter KA, Vaughan WG. The role of spiral (helical) computerized tomography with three-dimensional reconstruction in pediatric solid tumors. J Pediatr Surg 1995;30:317-21. Sternberg S. CT scans in children linked to cancer later. USA Today, June 19; 2012. Pereira JK, Burrows PE, Richards HM, Chuang SH, Babyn PS. Comparison of sedation regimens for pediatric outpatient CT. Pediatr Radiol 1993;23:341-4. Luker GD, Lee BC, Erickson KK. Spiral CT of the temporal bone in unsedated pediatric patients. AJNR Am J Neuroradiol 1993;14:1145-50. Coren ME, Ng V, Rubens M, Rosenthal M, Bush A. The value of ultrafast computed tomography in the investigation of pediatric chest disease. Pediatr Pulmonol 1998;26:389-95. Buls N, Bosmans H, Mommaert C, Malchair F, Clapuyt P, Everarts P. et al, CT pediatric doses in Belgium: A multi-centre Study Results from a dosimetry audit in 2007-2009: [Last accessed on 2007 Feb 18]. CT Dose Profiler, Probe for evaluation of CT systems manual -version 5.2A, RTI, Sweden. Available from: http://www.rti.se/ [Last accessed on 2014 May 21]. CT Dose Profile Analyzer manual -version 4.0B, RTI, Sweden. Available from: http://www.rti.se/ [Last accessed on 2010 May 20]. European Guidelines on Quality Criteria for Computed Tomography. Report EUR 16262. Brussels, Belgium: European Commission; 1999. Zacharias C, Alessio AM, Otto RK, Iyer RS, Philips GS, Swanson JO. et al., Pediatric CT: Strategies to Lower Radiation Dose. AJR 2013;200:950–56. Athertont JV, Huda W. CT doses in cylindrical phantoms. Phys Med Biol 1995;40:891-911. Stratis A, Molfetas M, Panagiotakis N, Louizi A, Kottou S. Accuracy of CT dose monitor values: A multicentric study. Radiat Prot Dosimetry 2013:1-5. Saravanakumar A, Vaideki K, Govindarajan KN, Jayakumar S. Establishment of diagnostic reference levels in computed tomography for select procedures in Pudhuchery, India. J Med Phys 2013;39:50-5. AERB/RSD/MDX-CT/QAR/2010, Acceptance/Performance test for Computed Tomography (CT) scanner. Available from: http://www.aerb.gov.in/AERBPortal/pages/English/X-Ray/X-Ray_jsp.action [Last accessed on 2015 Apr 11].